This week’s challenge was related to the top 10 things learners need to know about Articulate Storyline, and I really had a lot of fun re-watching the tutorials I included. The E-Learning Heroes community is one of the greatest resources I’ve found as an Instructional Designer. It’s current, and all of the community members are extremely helpful and proactive – not only in addressing concerns of their peers, but they’re passionate about what they do and love to share their knowledge! In considering this challenge, I wanted to compile screencasts posted by various E-Learning Heroes that I have found particularly interesting and/or helpful. 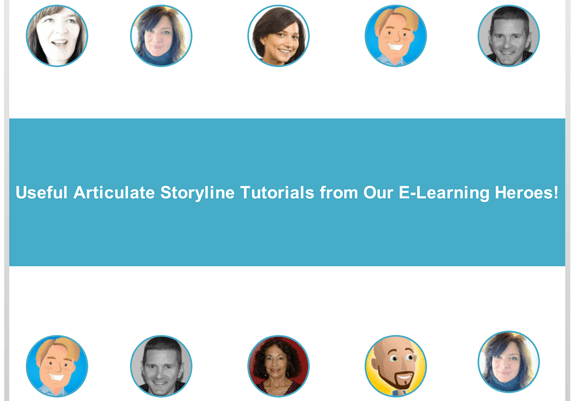 I scoured the forums and my personal messages to find a group of 10 tutorials I think everyone using Articulate Storyline should at least watch. I developed a simple interface using circular buttons, filled with an image of the individual providing the tutorial. When selected, a layer is triggered to appear, providing a brief explanation of the tutorial and a screen capture; the full tutorial is linked to and will open in a new window. An exit button is available on each layer so the user can return to the main ‘menu’. To view the complete interaction, click here. Like this post? Want more Instructional Design tips? Sign up below! Great design and demo, Ashley. You pulled together some really good tutorials. Nicely done, Ashley! I really liked how easy it was to browse all of your selections. Great navigation!